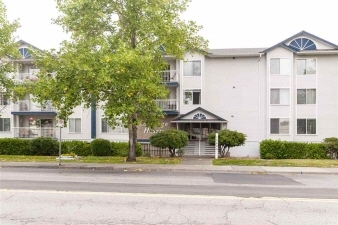 Description: Located in the heart of cloverdale, this lovely corner unit is bright, spacious & boasts an open floor plan. The kitchen has maple cabinets, tile floors & eating bar. The living room is large great for entertaining has sliders to a sunny balcony, newer laminate flooring giving the home a beachy feel. The master bedroom is large & features an ensuite with an updated full size walk in shower, & newer tile floor. Bedrooms are separated by living area for privacy. Bonus insuite laundry & storage. New hot water tank (under 1 yr.) Roof was done in 2013. Secure 55+ building with additional rv parking. Bus in front of building, shopping, & cloverdale fairgrounds just minutes away. No rentals or pets allowed. Not on ground level!